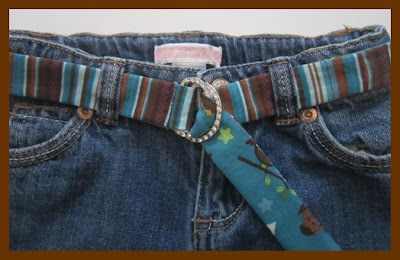 I decided to try to re-purpose a pair of Audrey's jeans. They fit except for the length, so the ruffles took care of that! I got a couple of fat quarters from a seller on Etsy to do the ruffles with. 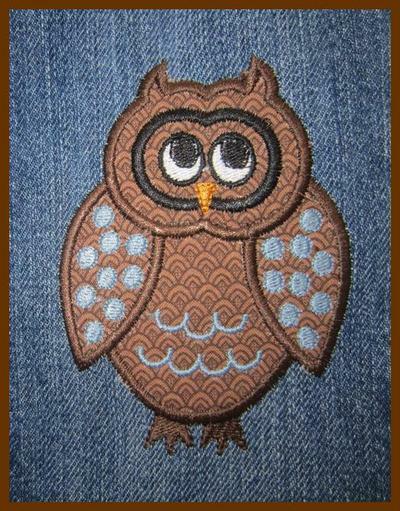 The fabric is by Riley Blake... the name is "Hooty Hoot". The amount of fabric worked out great! I just got a blank shirt to put the "A" on. The lil owl is from Embroidery-boutique. I think the little outfit turned out cute. Her favorite thing about this outfit is the belt... she loves it!!! That's all for now, Thanks for looking! 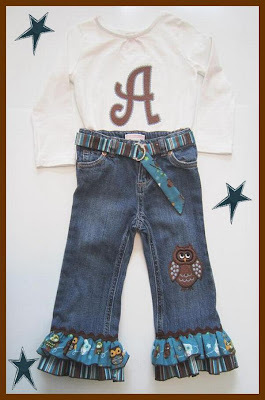 The jeans are just adorable! You are so creative. Another cute outfit! Glad that you're back sewing. I missed seeing all the beautiful outfits you create. They're darling! They sure don't look repurposed. Took a sewing break... I'm back! !